My sister had seen Bobby Flay battle The Doughnut Plant on Throwdown with Bobby Flay so when we decided to spend the day in the city together, she really didn’t care where we went as long as she got to taste some of those doughnuts. I don’t exactly need much convincing to go to a famous bakery (especially one that has peanut butter & chocolate doughnuts!) so off we went. Because I can never go to a bakery and purchase just one item, I left with 6 different doughnuts. Clockwise from top left: Peanut Butter & Jelly, Tres Leches, Blackout, Banana Pecan, Carrot Cake, another Peanut Butter & Jelly and a Coconut Cream. Again, I failed to take a photo until a few bites had been taken, but if you’ve visited this blog before, you should be used to that by now. Besides, I deserved to eat them fresh since this box of 7 doughnuts cost me $16 & change. Ah, NYC. I bought two PB&Js anticipating that Taste Tester and I would each want to eat a whole one. Sadly it was not so: the PB&J was the worst of the bunch! There was a faint peanut butter flavor on the first bite, but it was barely detectable after that. The jelly was fine but I thought overall the flavors should have been stronger. 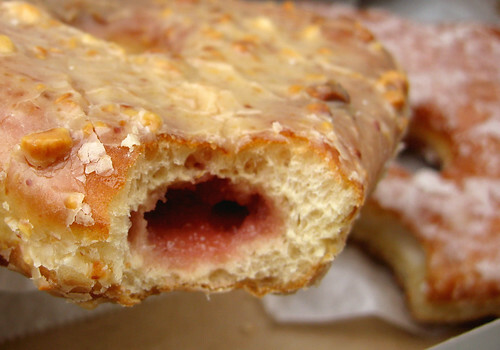 The texture was spot on and the doughnut was very fresh but the flavor was just blah. Upon taking a bite, Taste Tester declared that it tasted like Chinese food. Maybe the fried dough and peanut flavor reminded him of peanut noodles or something? I’m not really sure what he meant but I’m going to assume that Chinese food doughnut = bad. The Blackout as well suffered a little blah-ness. It was far better than the PB&J but considering this doughnut has gotten some hype, I expected more. 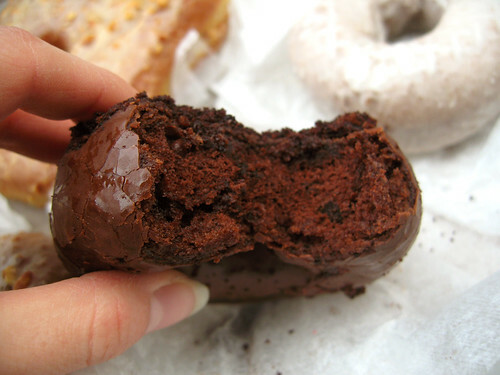 I enjoyed the pockets of chocolate pudding but thought the doughnut itself was a little dry and lacking in flavor. Next up was the Coconut Cream. Ah, the Coconut Cream. 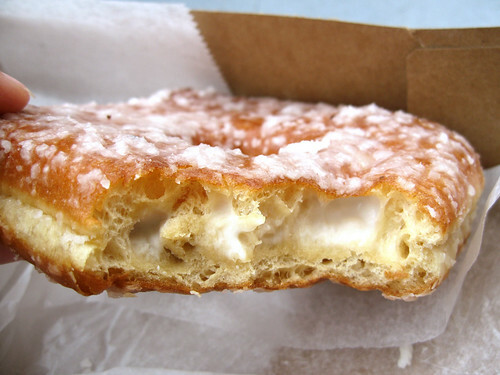 I’ve read about The Doughnut Plant before and no one ever talks about the Coconut Cream. It was delicious! It had a very strong coconut flavor and whatever is in that luscious cream filling – it was so smooth and yummy. If only I had bought two of these! The only other DP doughnut that I really enjoyed was the Tres Leches. It had these little pockets of what tasted kind of like vanilla pudding. It had a consistency that was kind of a cake / doughnut hybrid and had this ring of moisture around the edge that made it melt in your mouth. It didn’t really have a strong flavor aside from being sweet, but the texture was so lovely and really different than any other doughnut I’ve had. 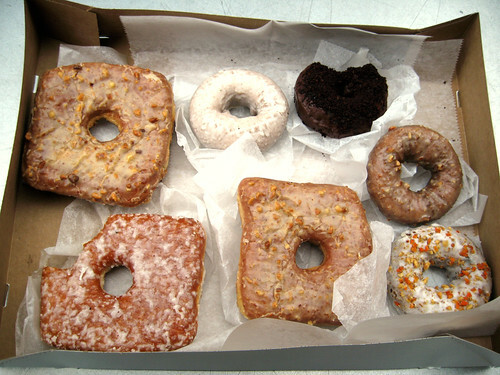 To conclude, The Doughnut Plant experience suffered a bit from being over-hyped, but we came away with a few gems. If you make your way there, keep your eyes on the prizes: the Coconut Cream and Tres Leches. The Banana Pecan and Carrot Cake were good as well, but not stunners. 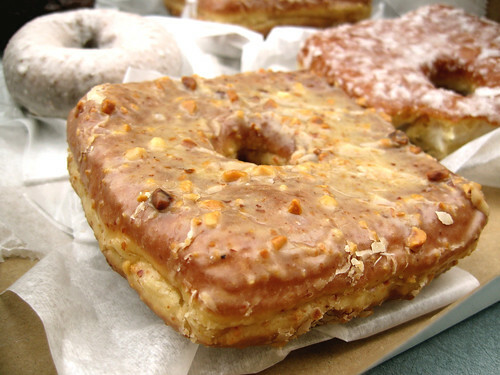 I guess we’ll keep the search going for stand-out CPB doughnuts. While we’re on this little doughnut kick, I just purchased this fun book dedicated to the donut by Sally Levitt Steinberg. 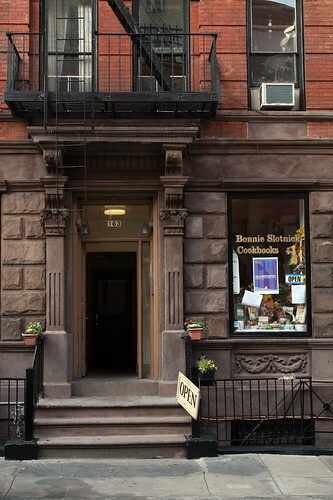 I got the book at the most adorable cookbook shop ever called Bonnie Slotnick Cookbooks. I had been dying to go for a really long time. This is part of what I love about New York – would you have even noticed this little window walking by, let alone realize that it’s a treasure trove of Cookbooks? It’s a small shop jam-packed wall-to-wall with cookbooks both new and old. Bonnie, the owner is clearly very enthusiastic about cookbooks and happy to chat with you about them. After my day in the city with Jenna, I came home and flipped through this new book of mine, only to find an excerpt on Mark Israel and his shop, The Doughnut Plant. It tells an interesting story of how Mark put his own modern-day spin on his Grandfather’s doughnut recipe by making gourmet (trans fat-free) doughnuts using fresh organic ingredients from farmer’s markets. Not having enough money for subways and cabs, he started out by delivering his doughnuts on his bicycle and managed to convince owners of coffee shops as well as Balducci’s and Dean and Deluca to carry his doughnuts just by presenting them with a box to taste. It’s a great story and makes me wish that I had liked them more. The week after our Doughnut Plant visit, Taste Tester and I were wandering around with Lindsay and stopped by the Peter Pan Bakery, which had been on my list for a long time. 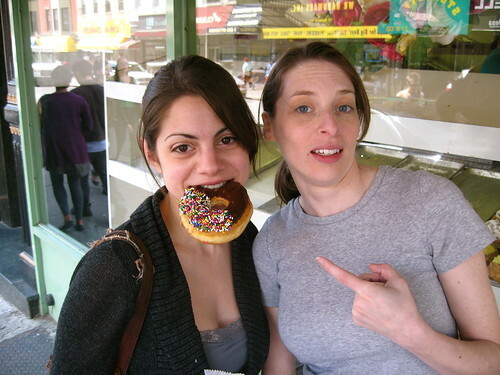 Here’s me and Lindsay posing with their chocolate-frosted doughnut. I don’t know if you can see, but she has chocolate on her mouth and I spilled sugar on my shirt. We were too excited about these doughnuts to be neat. I enjoyed Peter Pan’s donuts a lot. Theirs were a bit more old fashioned than DP’s but still had creative flavors and were very fresh and tasty. My favorites were the red velvet, chocolate and coconut. They didn’t have any peanut butter doughnuts but the chocolate had a nice rich chocolate flavor and had great texture as well. Oh and while I paid $16+ for 7 doughnuts at The Doughnut Plant, I only paid $4+ for 5 doughnuts at Peter Pan. I guess rent is a touch higher in LES than it is in Greenpoint – heh. And FYI, they make donut ice cream sandwiches in the summer. Did I just melt your brain a bit? 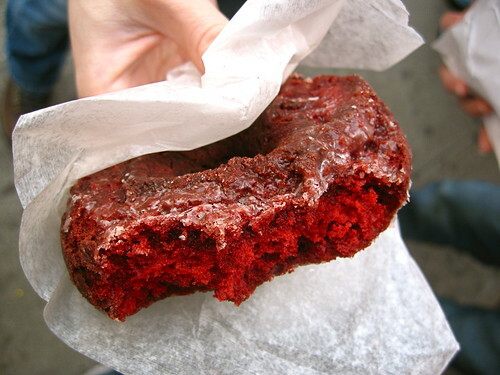 To taste the hottest doughnuts in NYC, head to Peter Pan Bakery and The Doughnut Plant! Ahhhhhh! My brain! It’s melting! Peter Pan has the BEST doughnuts! I have to stop there every time I’m in Greenpoint.